“Although the centipede has more body segments, generally, than the millipede, the former has only one pair of feet on each segment, while the latter has two pairs. 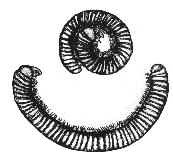 Centipedes have from 15 to 170-ood segments, millipedes from 20 to 60-odd. Both are members of the group called myriapoda, which comes from Greek “ten thousand feet” and which includes other arthropods.” From the “dictionary of differences, a comprehensive guide to the differences between over 5,000 easily misunderstood words and phrases”.